Everyone would love to have a set of perfectly white teeth, but so few of us do. Why? Well, the world is basically out to get your smile, at least when it comes to its color! Things like coffee, wine, tea, tobacco, genetics, and even natural aging can all leave your smile looking stained and discolored, and no store bought whitening treatment is going to be able to turn the tide. Fortunately, at Corbin Family Dental Care, we have a solution that is proven to make stains disappear and dramatically whiten the teeth: Zoom! Teeth Whitening. Zoom! 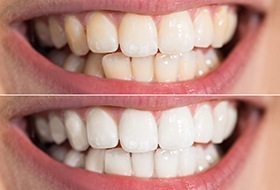 Teeth Whitening combines a powerful bleaching gel with a special low-UV light to eliminate stubborn stains in record time. If you want results as quickly as possible, we can give you a complete treatment in-office that only takes a little over an hour. Or, if you have a little more flexibility, we can send you home with your own custom-made Zoom! kit. It will have a set of mouth trays designed just for your smile and the powerful whitening gel you simply need to use daily for about two weeks. Whichever treatment you choose, you can look forward to having a smile that could be up to 10 shades whiter, guaranteeing that the world will take notice. Why Choose Corbin Family Dental Care for Zoom! Teeth Whitening?